A couple of weeks ago Stephen Hawking died. During his life, he was considered to be the most intelligent person on earth. He was also widely known because of his disability – a form of motor neuron disease which left his body helpless. Many considered Stephen Hawking to be an atheist, a non-believer. We might think, well, that’s not exactly encouraging news for us if the world’s most intelligent person rejects God. But in his later years, his brilliant mind turned to questions not of physics but of ethics. In a recent interview he said “the human failing I would most like to correct is aggression and the quality I would most like to magnify is empathy (compassion). Empathy (said Hawking) brings us together in a peaceful loving state”. Empathy, peace, love. That’s language not of physics but of humanity; made in the image and likeness of God. Great science nudges up to questions that even its most brilliant practitioners look elsewhere to answer. In the superb film of Stephen Hawking’s life (The theory of Everything) there is a stunning moment when his wife Jane turns to him after he has been working in his study late at night and asks: what are you working on? He pauses, looks her in the face and says: “I’m working on a new book in which I refute everything I have thus far believed”. The greatest mind in the world saying, I was wrong. My point here is that that we human beings are always limited, never complete, we never have all the answers. Indeed, our greatness lies in the questions we ask rather than the answers we hold. That sense of limited humanity nudging up to the limitless omnipotence of God, is something we experience wondrously in tonight’s liturgy. All liturgy is God’s work; God’s mahi. In a kiwi culture where we so quickly place ourselves at the centre, the importance of understanding the sacraments as God’s work cannot be overstated. Sacraments are never rewards for our achievements. That would make God redundant. So, we have gathered here tonight not around ourselves, not as a DIY community, but in and through and with Jesus fully human and fully divine. “The spirit of the Lord had been given to him, the Lord had anointed him” (cf. First reading, Isaiah 61, and Gospel reading Luke 4). Therefore “all eyes in the synagogue were fixed on him” (cf. Luke 4) watching, waiting. Then he spoke. Not giving answers, but raising questions. Questions which so deeply disturbed their pre-set template answers, that they chased Jesus out of the synagogue. To where did Jesus go? Not to a safe zone of escape, but into the fields and lanes that lay ahead. We read in the Gospel that the few who did follow Jesus were led to the homes and places of the mentally unwell and the physically sick of Capernaum. He and they – us – brought good news to the poor, freed people from the depression of shame or whakamā, healed wounded hearts and minds, gave a hand up to those trodden down by debts and unfair wages and crippling bills. Our faith is an embrace of (not escape from) time; an embracing not avoiding of tomorrow, of next week, of this year. Pope Francis in each of his most important writings – two encyclicals and two apostolic exhortations – has used a curious phrase: “time is greater than space”. What does that mean? He likens ‘space’ to a kind of escape; an attempt to stop the time clock of today and tomorrow and this week. ‘Space’ is where we park up with our own ideas and static answers, avoiding the paths and lanes, or homes and places, into which Jesus wants to lead us today and tomorrow. ‘Space’ avoids the realities of people’s lived marriages and relationships and family life, ‘space’ avoids the imperfections of our lived or not lived priesthood. This earthy insight of contrast to which Pope Francis alerts us – time or space, embrace or escape, listening or repeating ad nauseam, action or talk, out and about or closeted in our office – concerns also our own faith communities here in New Zealand. I often ask, to where do our youth ministry ‘events’ (spaces?) lead our young? Is the event an embrace of or a diversion from commitment in time to Sunday Mass? Where do our parish or diocesan planning meetings lead us? What happens tomorrow as a consequence of today’s meeting? Filed minutes or new visits and initiatives? Does our theological and canonical language accompany life or define it as though life were static rather than a dynamic unfolding of our baptismal vocation? It is good then that we remind ourselves that our oils blessed tonight are fluid living instruments of God’s work. In taking them back to our Churches and communities, we bring Christ not into a safe depositary but into the lives of our people tomorrow, this week, next month and this year. 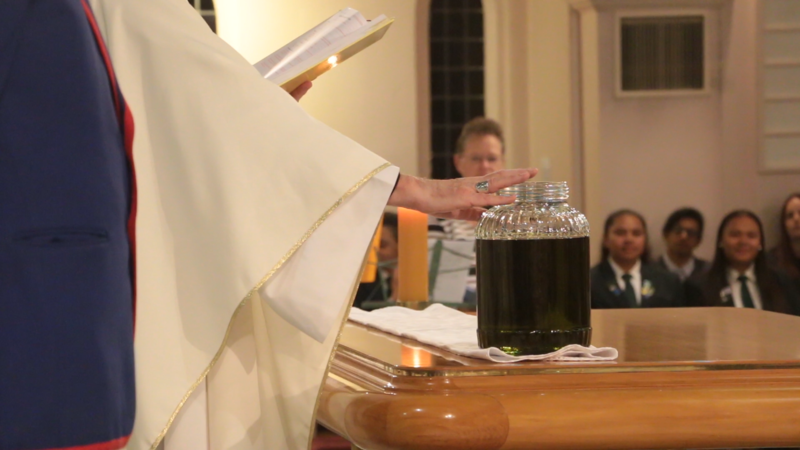 The oil of catechumens takes us out of our offices and meetings, takes us away from our desks and screens, into our schools and work places and hostels and neighbourhood streets as we like every generation, through the Holy Spirit, draw new people into God’s family the Church. The oil of the sick leads us into our hospitals and hospices, and resthomes. It strengthens our compassion and empathy. This oil pushes back against the tide of dark political forces at work in our country seeking to eliminate the vulnerable, seeking to replace the daily witness of care and empathy with the one off ‘space’ of delete (euthanasia). And the oil of Chrism brings us face to face with the enigma of an omnipotent God who chooses to become one of us; who chased out of the synagogue turns not away but towards us to anoint us, to make us sharers in God’s very own divine life, reminding us that humanity is the living home of all virtues, reminding us that even the most brilliant of our human endevaours and insights are always the fruit of God at work within us calling us to be God’s own people, walking in God’s marvellous light (refrain) as a new creation (Rite of Baptism). Kia kaha to that. Coraggio! Deep thanks to all of you here tonight – priests and people – for all you are doing to bring the greatness of God and the humanity of Christ to our communities through the power of te Wairua Tapu.